Beautiful mediterranean filigree sterling silver tussie mussie. 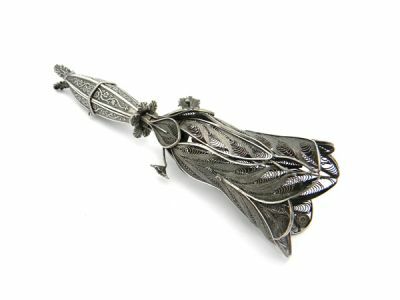 The silver filigree is in the shape of delicately overlapping leaves. There are flowers along the handle and flowers extending from the base of the cup. This is quite a large tussie mussie, measuring 18 cm long. No pin.